Prebiotic effect: Stimulates the growth of healthy bacteria in the gut and the growth of intestinal bifidobacteria. 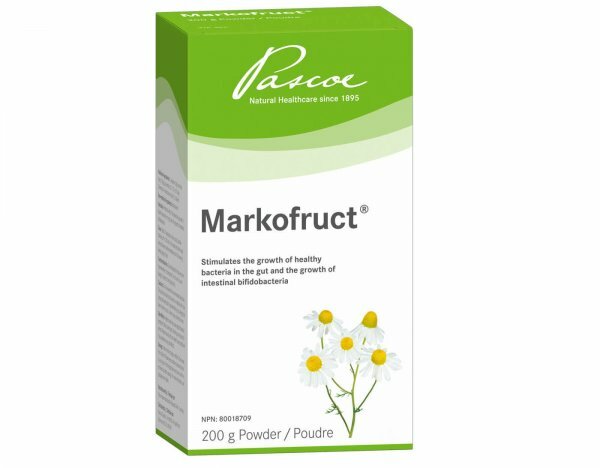 Markofruct from Pascoe is a prebiotic product, which supports the healthy balance of the gut flora, has a positive effect on metabolism and enhances the body’s natural immune defense. It improves the microbial ecology of the gut and protects against some bacterial pathogens, particularly in the large intestine. Suggestive dosing is 3 tablespoons, twice a day taken dissolved in 200mL of hot water before breakfast and in the evening before bed. Prebiotics are a non-digestible plant-based fibre compound. They act like fertilizers and work to stimulate the growth of healthy bacteria in the gut. Prebiotics are essential to healthy gut flora and the growth of intestinal bifidobacteria. Prebiotics and probiotics play an important synergistic role that lead to many health benefits. Probiotics, which are live microorganisms that live inside your gastrointestinal (GI) tract, are fed by prebiotics. Therefore, the more prebiotics that the probiotics have to eat, the healthier your gut will be, as the live bacteria will work more efficiently. GI health is more than just linked to digestive issues; it can be linked to, or the root cause of, other health issues. The human body has about 100 million nerve cells called Enteric Nervous System (ENS), which line the GI tract and control digestion. Therefore, the ENS is in constant communication with the brain. A healthy GI system (i.e. a system with high levels of prebiotics to feed the live probiotics) communicates effortlessly with the brain. But a less healthy GI system has a harder time communicating with the brain, resulting in health issues. Adults: 3 teaspoons, twice a day. Dissolve Markofruct® in 200 ml of hot water and drink slowly while still warm before breakfast and in the evening before going to bed. Contraindicated in those who are hypersensitive to chamomile or plants of the daisy family. Do not exceed the recommended daily dose. This product should not be used as a substitute for a balanced and varied diet. Pregnancy and breastfeeding: No risks have emerged so far within the recommended dose. Hypersensitivity (e.g. allergy) has been known to occur, in which case, discontinue use. 1 teaspoonful of powder (= 3g) contains 0.025 bread units. Started taking Markofruct, initially, there was not much difference, but after about 2 days, I felt my digestion was way better. Constipation issues are almost non-existent now, same with diarrhea (unless I eat at a super oily junk food). Great product, I highly recommend.